This anthology assembled by Ross Heaven mentions ayahuasca but focuses on San Pedro. Contributors describe its use in healing abuse, addiction recovery and psychic development. 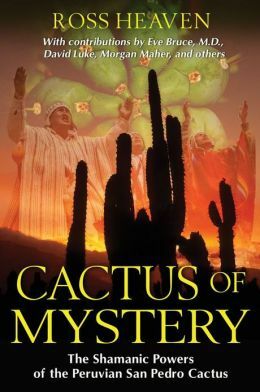 These miracles do not come easy; the cactus has unpleasant intestinal side effects. Do not confuse San Pedro with ayahuasca: while both cacti induce visionary experiences and complement healings in one another, each produces a different experience. Ayahuasca, often referred to as “she” throughout the collected essays in Cactus of Mystery, takes the person within. San Pedro takes the person without – assisting that person in seeing his or her connection to the Earth, to life, even to children, ancestors, the future and the past. Those who contributed billed San Pedro a miracle cure or at least a kickoff to curative work for themselves. Most were also careful to share anecdotes of those who did not find San Pedro quite so beneficial: addicts that returned to use upon leaving their ceremonies, people who had bad trips, people who experienced nothing. This is definitely a book for a specialist. Medicinal/spiritual entheogenic work demands years of training – it can’t just be done for a trippy ride because self-confrontation can come to anyone who partakes. Aside from interesting facts about the plant and about plant sentience, most of the book speaks to experience with San Pedro. Fascinating, but meant only for the entheogenically inclined. Recommended, but for specialists only.